As part of the NBA's package of Christmas telecasts, the champion Golden State Warriors (27-1) will host Cleveland (19-7) in a rematch of last season's finals. The Warriors have been the big story of the 2015-16 season, starting out 24-0 (a 28-game regular-season winning streak if one includes the last four games of the previous season) to threaten the 1971-72 Los Angeles Lakers' record 33-game winning streak. After a December 12 loss at Milwaukee to end the streak, Golden State has won three in a row. On this holiday occasion, I'd like to look back on the Warriors' winning streak, using an unusual lens. Offense is the team's forte, as seen in the NBA team-scoring rankings. Some basketball analysts look at statistics such as teams’ points per game or points per 100 possessions. To understand the Golden State Warriors’ success over the past season and a half, in my view, we have to look at smaller segments of play. Not halves, not quarters, but six-minute “eighths” of games. When the first-quarter clock runs down from 12:00 to 6:01, that would be the first eighth; from 6:00 to 0:00, the second. The eighth and final eighth would run from 6:00 to 0:00 of the fourth quarter. In the 2015 playoffs, the Warriors played 21 games and thus 168 eighths of basketball (overtimes are not counted within my analyses). In 22 of these 168 eighths (13%), Golden State scored 18 or more points, which translates into 3 or more points per minute. If a team maintained a 3-points/minute pace for a full 48-minute game, it would score 144 points. Thus, I use 18+ point eighths as a marker of offensive explosiveness. The 22 eighths in which the Dubs scored 18+ points during these playoffs included three of 24 points (4 points per minute) and one of 25 points. The Warriors’ best eighth of the current season, as far as I can tell, occurred in the last six minutes of the first quarter on December 8 at Indiana. After scoring 17 points in the first 6:00 of the quarter, the Dubs added 27 points in the latter half of the first quarter (the second eighth of the game). This explosion included four treys (plus Klay Thompson making all three free throws after being fouled behind the arc). After the Warriors’ 114-98 win at Brooklyn to go 22-0, acting coach Luke Walton was quoted as saying that, "It's one of our biggest strengths, is that we're never out of a game and we're always one little run away from putting a game away." In some ways, this finding is totally intuitive. 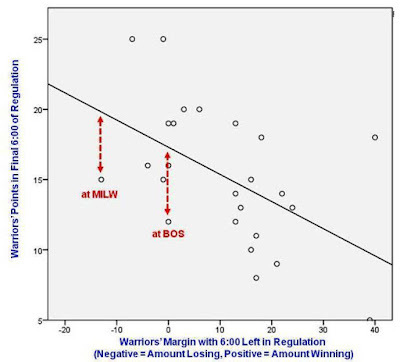 Trailing or being tied should motivate a team (especially one, such as the Warriors, who were trying to maintain a long winning streak) to play extra hard; conversely, when a team is way ahead, it likely will put reserves in the game and run time off the clock, both resulting in lower offensive output. In another way, however, the finding is not so intuitive. If you’re trailing or tied late in the game, it could mean you are playing a tough opponent and/or having an off-night, which are not conducive to big scoring runs. The above graph also shows that failure to respond as expected is what put the Warriors’ winning streak in jeopardy in Game 24 at Boston (a double-overtime Golden State win) and helped end it the next night in Milwaukee. According to the trend-line projection, the Dubs would have been expected to score 17 or 18 points in the final eighth of the Celtics game, but instead scored only 12 (this discrepancy is depicted by the red dashed vertical line). Trailing by 13 at Milwaukee, Golden State would have been expected to put up 20 in the final six minutes, but instead scored only 15. * Given that the Boston and Milwaukee games were the sixth and seventh of a seven-game road trip, the late-game loss of the Warriors’ explosiveness doesn’t seem surprising. 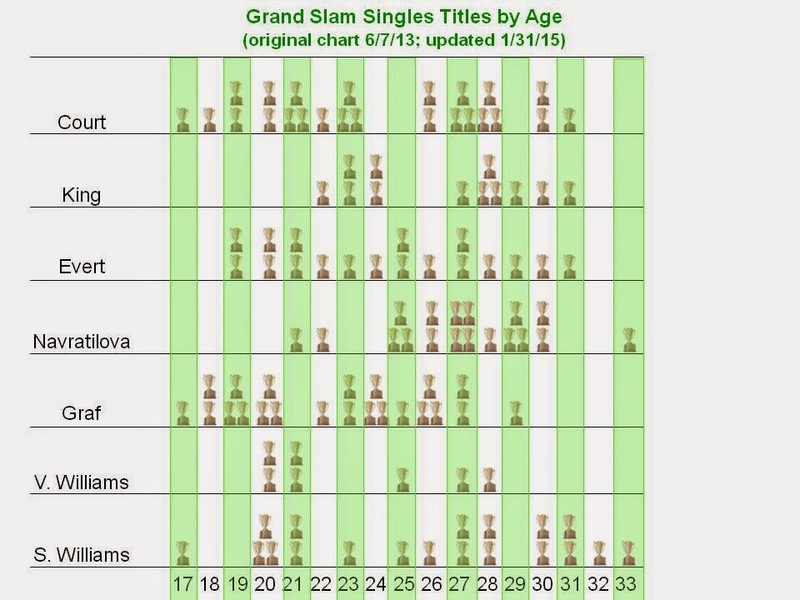 I don’t expect media outlets to replace the standard quarter-based line-score with one organized by eighths. For highly explosive teams such as the Warriors, however, I do believe eighths are a useful lens for statistical analysis. *The Warriors lost to Milwaukee by 13 (108-95), so strictly speaking, even if Golden State had scored the extra five points predicted by the correlational analysis, it still would have lost. Had the Warriors shown more offensive prowess in the final 6:00, however, the Bucks might have begun to feel pressure and perhaps the ending would have unfolded differently. Living members and fans of the 1971-72 Los Angeles Lakers can rest easy, as that team's 33-game winning streak will remain the NBA record for the foreseeable future. Whether you counted the Golden State Warriors' current win streak at 24 or 28 games (including the last four of the 2014-15 regular season), it doesn't matter. The Warriors' streak is now over, as moments ago, they fell at Milwaukee, 108-95. The Bucks held a double-digit lead for much of the contest. 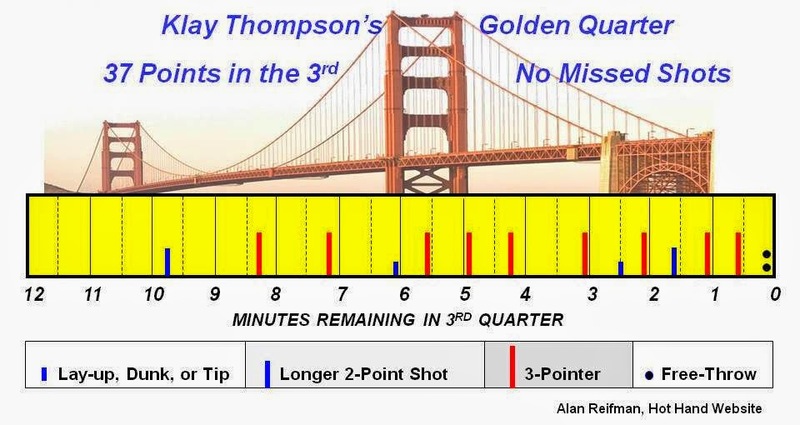 A few times late in the third quarter and early in the fourth, Golden State cut the deficit to three points or fewer, but never could tie the game or take the lead (play-by-play sheet). Playing the final game of a seven-game road-trip, just one night after a double-overtime win in Boston, the Warriors appeared spent. Should Warriors' 4 Wins at End of 2014-15 Regular Season Count as Part of Current Winning Streak? As virtually all readers of this blog would know, the Golden State Warriors have yet to lose in the 2015-16 NBA season, increasing their record to 23-0 with last night's win at Indiana. The NBA record for longest winning streak is, of course, the 1971-72 Los Angeles Lakers' 33-game stretch. 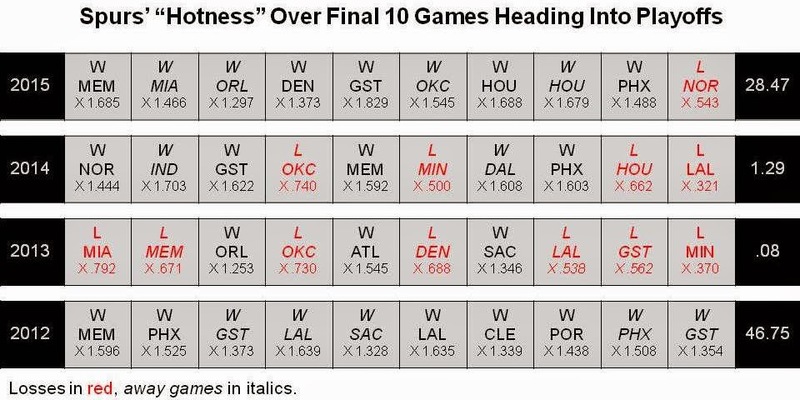 So the Warriors are 10 wins shy of the record. Well, not necessarily. Golden State won its last four regular-season games of the previous season, so it is technically accurate to say the "Dubs," as they're sometimes called, have won 27 straight regular-season games. After I mentioned on Twitter the idea of counting the last four games of 2014-15, Lakers fan Len Lester tweeted at me that "if you're carrying over last season gotta include post season too." The Warriors won the NBA title last season, but lost a combined five games in the playoffs. In thinking about Len's point, I have to admit that it's more than a little odd to claim a continuous win streak from April 2015 (when the regular season ended) to the present, when Golden State lost five games in between. Hypothetically, if the Warriors get to 30-0 just in the current season and then lose -- giving them 34 straight wins over two regular seasons -- I suspect the NBA might create two entries in its record book: longest winning streak within a single regular season, and longest regular-season winning streak spanning multiple seasons. I've added a poll in the right-hand column, so readers can vote on whether the last four wins of the previous season should be added to Golden State's current total. 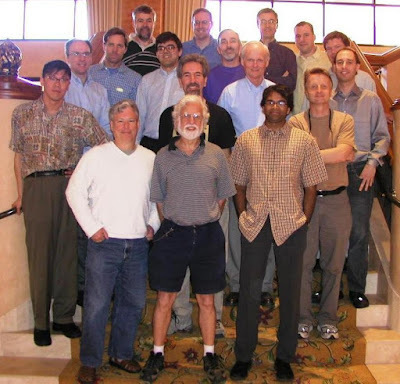 In March 2003, I attended a small, informal conference in Scottsdale, Arizona (strategically selected to coincide with spring training) with sabermetrically inclined academicians and sports journalists/analysts. The conference was mentioned three days ago in a Wall Street Journal interview with Oakland A's General Manager Billy Beane and Boston Red Sox adviser Bill James (link). My friend Mike Gustafson, remembering that I had attended the conference, brought the WSJ article to my attention (Thanks Mike!). WSJ: Is there another sport that stands out to either of you as being most ripe for the kind of revolution baseball has undergone with analytics? James: Football, from a popular perception angle, has lots of openings for analysts to rush in. There’s been this ongoing debate in football. Billy and I met in Arizona. When was that? Beane: 2000, 2001 maybe. It was a little half-conference that Bill had and I joined him for. It was before the book. Beane was a couple of years off, and the football analyst mentioned by James is David Romer of UC Berkeley (not AT&T, unless he did research for the telecommunications giant at some other point in his career). Other than that, however, Beane and James were pretty accurate about the conference. Here's a link to Romer's paper, by the way. 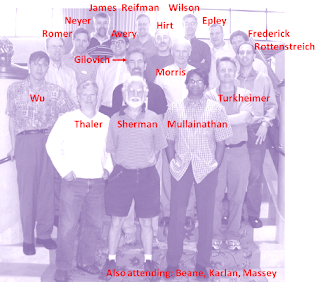 My connection is that, along with Tom Gilovich, I was representing hot-hand research. Most of the participants in the meeting are shown in the following photo (with a legend to identify participants at the very bottom of this posting). You may click on the graphics to enlarge them. The "distinguished economist" from Chicago is Richard Thaler (first row, white shirt). Among his other accomplishments, Thaler co-authored the book Nudge in 2008. Thaler co-organized the conference with Jim Sherman of Indiana University (standing next to Thaler). Beane is not shown in the photo, as he was busy overseeing the A's from their nearby spring-training complex and took time from his day to come by the conference to speak at one session. One broad theme addressed at the conference was the future of systematic empirical research in guiding sports teams' decision-making. Twelve years post-conference, I think it's safe to say that the use of such research has expanded dramatically beyond the A's, Red Sox, and any other teams that were looking at sabermetrics in 2003. In 2015, ESPN The Magazine, which has been issuing an annual Sports Analytics Issue for at least the past few years, ranked all MLB, NBA, NHL, and NFL franchises on their commitment to sabermetrics, using a five-level scale (All-In, Believers, One Foot In, Skeptics, and Non-Believers). With the exception of the NFL (where no teams were listed as All-In), the combined total for All-In and Believers exceeded that for Skeptics and Non-Believers in all sports. Another indicator is the annual MIT Sloan Sports Analytics Conference, the history of which is documented here. The inaugural meeting in 2007 was held on the MIT campus and attracted approximately 175 people. By 2015, attendance had jumped to 3,200, with the festivities now being held in a large convention center. Three league commissioners (NBA, MLB, and Major League Soccer) spoke at the 2015 conference. Here's the legend identifying participants in the 2003 Scottsdale conference. The San Antonio Spurs, owner of five NBA titles including last year's, were floundering for much of the current season, at least relative to their high standards. A four-game losing streak in late February put San Antonio at 34-23. Perhaps having the oldest roster in the NBA was starting to catch up with the Spurs. From that point on, however, Coach Gregg Popovich's crew went 21-4 to finish with a regular-season record of 55-27. And it wasn't just quantity of wins, but also quality, as the Spurs' hot streak included a March 22 win at Atlanta, an April 5 home win over Golden State, and a sweep of an April 8/10 home-and-home match-up vs. Houston. Baseball-statistics maven Bill James has a statistic he calls "temperature" to assess how hot or cold an individual or team is at the moment. According to this article, the formula adds a standard value to a team's temperature for each win in a streak, regardless of the quality of opposition and other possible features of each win (e.g., home/away, margin of victory). James's temperature for individual baseball players' hotness puts greater weight on recent than distant performance, but it's not clear his team formulas do the same. I started thinking about a temperature statistic for basketball teams, incorporating quality of opposition (with additional factors such as those listed above possibly being added later). The core concepts are that, against a tough opponent, a win should raise a team's temperature a lot, but a loss shouldn't hurt too much. Conversely, against a weak opponent, a loss should be damaging, but a win not very rewarding. In my system, a team starts at the neutral point of 1.00. Then, after each game, the previous value is multiplied by an update factor. The multiplier after a win is (1 + opponent's winning percentage), so that the better the opponent, the larger the rise in temperature. 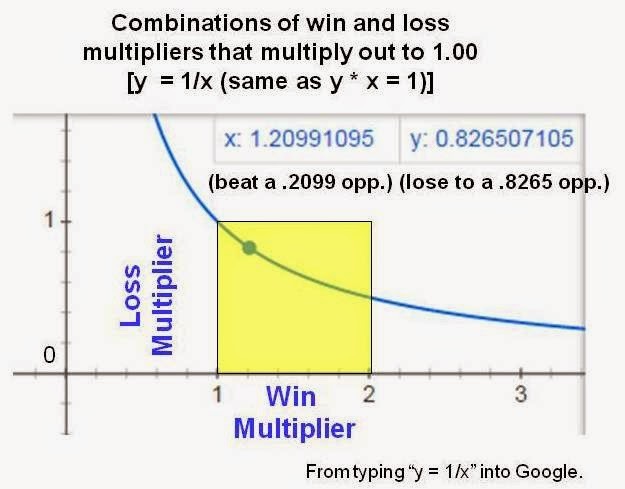 The multiplier after a loss is just the opponent's winning percentage, which will drop the temperature (multiplying anything by a number greater than 1.00 increases value, whereas multiplying something by a number between 0.00-1.00 decreases value). The following graphic (on which you can click to enlarge) provides some examples. The opponent's winning percentage (right before you've played them) appears on the horizontal axis, the red and blue lines are used after a win or loss, respectively, and the multiplier after a game appears on the vertical axis. As one example, suppose your opponent enters the game with a .750 winning percentage and you beat this opponent. The previous value of your "temperature" is then multiplied by 1.750; this is a bigger increase than if you beat a .600 team (which would result in a multiplier of 1.600). 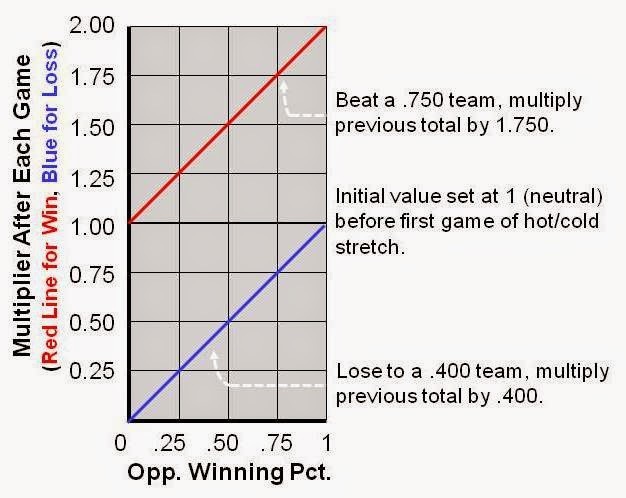 Conversely, losing to a .400 teams requires you to multiply your previous temperature by .400, cutting value by more than half (e.g., a previous value of 10 would become 4). Losing to a .800 team, in contrast, doesn't hurt as much (multiplying the previous value by .800). In order for a win and a loss to cancel each other out and return a team to the neutral point of 1.00, a more dramatic win, such as beating a .750 team, would be offset by losing to a not-quite-as-good team, in this case with a pre-game .571 win percentage, and vice-versa (1.750 x .571 = 1.00, within rounding). 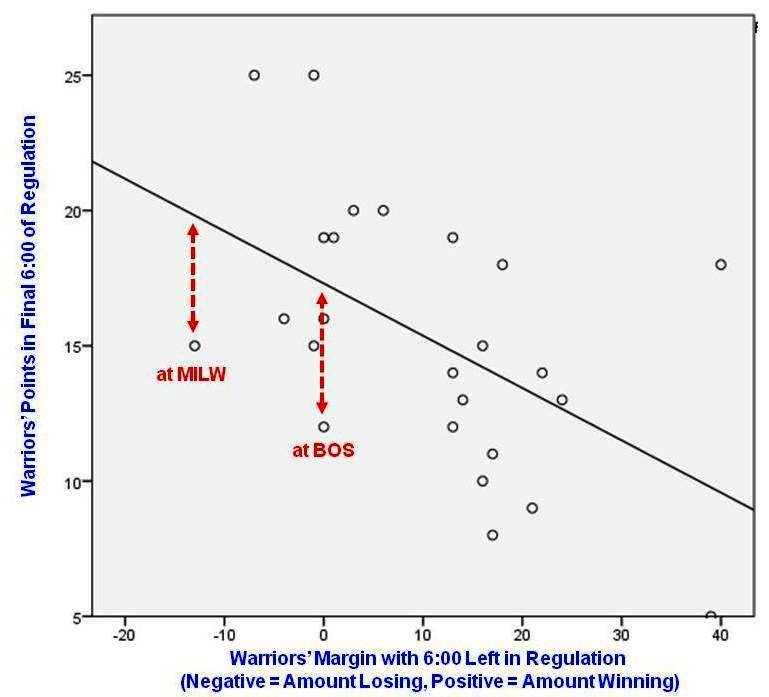 The following graph provides a general characterization of the relationship between win and loss multipliers in order to restore a team to 1.00 (neutrality), plus another example. Enough formulas, let's get to some basketball! First, we see the Spurs' hotness for the final 10 games of each of the past four regular seasons (I think you'll need to click on this chart!). San Antonio's hotness over its last 10 games of the 2014-15 season is 28.47, obtained by multiplying the automatic start value of 1.00 x 1.685 (for the win over Memphis) x 1.466 (for the win over Miami), and so forth. The season-ending loss to New Orleans (which entered the game with a .543 winning percentage) essentially halved the Spurs' hotness value (i.e., multiplying by .543) in one fell swoop. The fact that the Spurs' hotness was right around the neutral point of 1.00 in both 2013-14, when they won the NBA championship, and in 2012-13, when only a statistically unlikely comeback by Miami in Game 6 of the finals prevented a San Antonio title, suggests hotness over the final 10 games is not important.Similar findings have been obtained for baseball. In the lockout-shortened 2011-12 season, however, the Spurs followed up their 10-game winning streak to end the regular season (hotness = 46.75) with 10 straight wins to begin the playoffs, before being eliminated. San Antonio didn't win the title in 2011-12, but a 20-game winning streak spanning the regular season and playoffs is pretty good! Let's look at some other teams that were hot over their final 10 regular-season games in recent years. As shown in the top row, the Spurs' opponent in the opening round of this year's playoffs (getting underway tonight), the Los Angeles Clippers, are pretty hot at the moment, too. Both teams are 9-1 over their final 10 regular-season games, but San Antonio (28.47) is hotter than L.A. (18.47), due to the Spurs' higher-quality opposition. For what it's worth, however, the Clippers' 18.47 hotness exceeds the 2012-13 NBA champion Miami Heat's 15.14 in also going 9-1 over its final 10 regular-season games (second row). Looking at teams with 8-2 records over their final 10 regular-season games this year, the Golden State Warriors, who had far-and-away the NBA's best record (67-15), had a hotness value of 9.76 (third row), and the Boston Celtics, who needed a feverish run just to make the playoffs, had a hotness of 9.65 (last row). As I noted above, other factors could be added to the mix. Perhaps a team's hotness could be multiplied by bonus adjustment factors of 1.05 or 1.10 (or something else) for each road win or blowout win, or could be multiplied by a deflationary factor of .95 or .90 for a home loss. Recency of performance, which I don't think was a big issue here due to the focus just on teams' final 10 games, could also be taken into account by multiplying newer wins by greater enhancement factors than older wins. Finally, teams' records toward the end of the regular season can be misleading due to resting of players. That's another factor for which adjustments would be helpful. Please share any ideas you have for further refinements, in the Comments section. The Atlanta Hawks' Kyle Korver should be familiar to aficionados of hot shooting. The 6-foot-7 shooting guard once had a streak, spanning the 2012-13 and 2013-14 seasons, of making at least one three-pointer in a record 127 straight games (I analyzed Korver's streak here, when it was at 98 games). During the 2014-15 season, Korver has sought out further frontiers of shooting accuracy. As Ian Levy pointed out back on February 13, Korver was threatening to record the unprecedented feat of hitting 50 percent on all shots from the field, 50 percent from three-point land, and 90 percent on free throws, a so-called 50/50/90 season. As the Hawks enter their regular-season finale tonight at Chicago, Korver is slightly below all three milestone levels, with a .487 field-goal percentage, .493 three-point percentage, and .897 free-throw percentage (Korver stats page). It's not even clear how much -- if at all -- Korver will play tonight, as the Hawks rested Korver and other key players last Sunday at Washington, although he played 34 minutes Monday vs. New York. However, assuming he plays tonight, what kind of shooting numbers will he need to post to reach each of the three criteria? 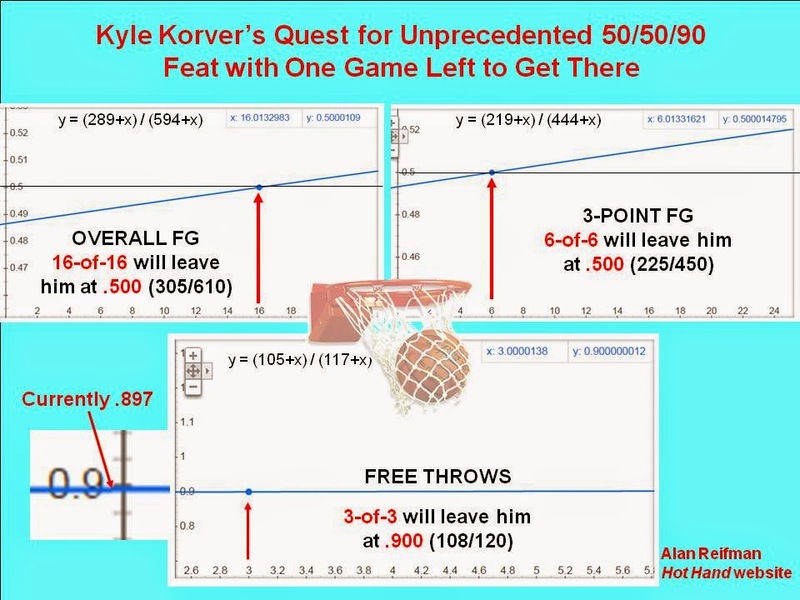 I plotted some equations for how many shots without a miss Korver would need to make to reach .500 on overall field goals and treys, and .900 on free throws. Even if Korver missed a shot of a given type, it would be mathematically possible for him to still reach the milestone, but far more makes and attempts would be necessary than if he never missed. where y represents Korver's three-point shooting percentage and x represents each new attempt (which is always made). In other words, each new attempt raises his number of attempts beyond the current 444 and each new make raises his number of makes beyond the current 219. By how many attempts (and makes) must x rise to bring y to .500? One can type an equation, such as the one above, into Google, which will automatically generate a plot. Here are the resulting plots for Korver in all three shooting categories (you may click on the graphic to enlarge it). We see in the upper-right graph that Korver's three-point shooting line (blue upward trend) crosses the .500 threshold (black horizontal line) at six attempts. Six more made threes (again, without a miss) would give him 225, which would be half the new number of attempts, 450. Alternatively, Korver could hit the .500 threshold with a 7-of-8 performance behind the arc, resulting in (226/452). As I said, each miss progressively increases the number of shots he would need to make. Making 6-of-6 on threes is not terribly likely. Given that his three-point percentage is very close to 50%, let's imagine coin-tossing. Korver would have to flip heads six times in a row, which has a probability of 1-in-64. 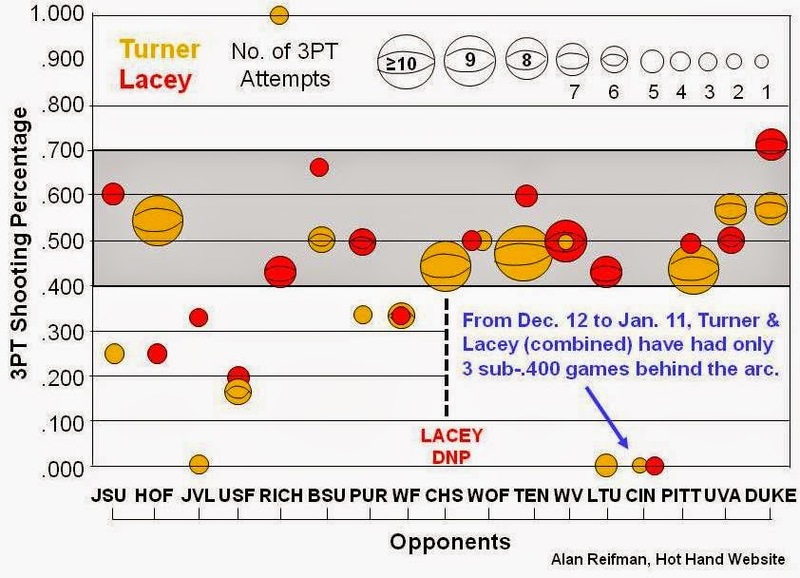 Finishing at .900 on free throws should be relatively easy. Korver just needs to make at least three free throws without a miss. If he's not perfect, he would have to make 12 of 13 to reach .900 (117/130). Lastly, we have overall field-goal percentage. To reach .500, Korver would need a 16-for-16 night (resulting in 305/610) or, alternatively, 17-of-18 (306/612). Clearly, Korver has his work cut out for him. At the college level, Christian Laettner's performance against Kentucky in the 1992 regional final comes to mind; not only did he hit the turnaround buzzer-beater, but he also hit 10-of-10 from the floor and 10-of-10 from the stripe. Also, Bill Walton hit on 21-of-22 field goals in the 1973 final. That's the kind of game Korver's looking at. UPDATE: Korver went 3-of-6 from the floor at Chicago to finish the regular season with a .487 field-goal percentage; 2-of-5 on three-pointers for a final percentage of .492 beyond the arc; and 1-of-1 from the free-throw line to finish at .898 from the stripe (box score; final regular-season statistics).